Use Case – Treat your top referrers special and offer them more rewards for inviting more friends and boosting revenue. AppVirality gives you the flexibility to configure rewards for a referrer based on the number of referrals that he/she drives. Navigation to configure tier-based rewards as follows. From your Dashboard, you may either navigate to Create Campaign directly. You may otherwise do the same from your App Details page: just choose to edit an existing campaign. Steps are simple & quite intuitive. Select the event type you want to schedule the reward upon: Install, Sign-Up, Transaction or any custom event you may have relevance for your app. Select the event type as Install then you will see Basic and Advanced switch with by default Basic selected. Click on Advanced, now you will see Tier based Rewards Section. Now you can enter the reward value you want to give for referrer based on the friend range. As shown in the below screenshot I have given reward value as 10 for friends range 1 to 5 which means, the referrer will get a reward of 10 $ for his first five friends (on install). You can add multiple filters by clicking on “+” button. 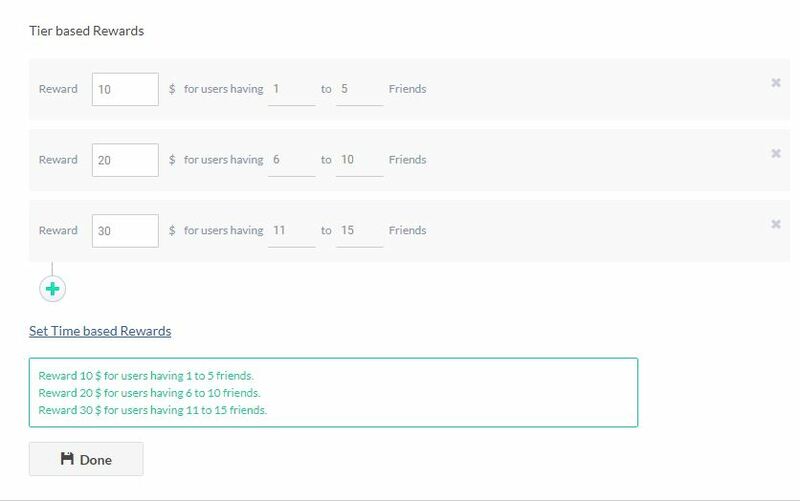 I have added another filter reward value as 20 $ for friends range 6 to 10 which means, the referrer will get a reward of 20 $ for his 6 to 10 friends on install. Similarly, for friends range 11 to 15 referrer will get the reward of 30$. Click on Done and save the campaign. Similarly, you can configure tier-based rewards for referrer on signup or transaction or custom events. Here is an example of how to configure Tier based rewards for referrer on transaction event. Use Case – Give double rewards during a special day or time (ex – Refer and get double rewards this black friday). AppVirality gives you the flexibility to configure rewards for a referrer based on the time their friends install/register. 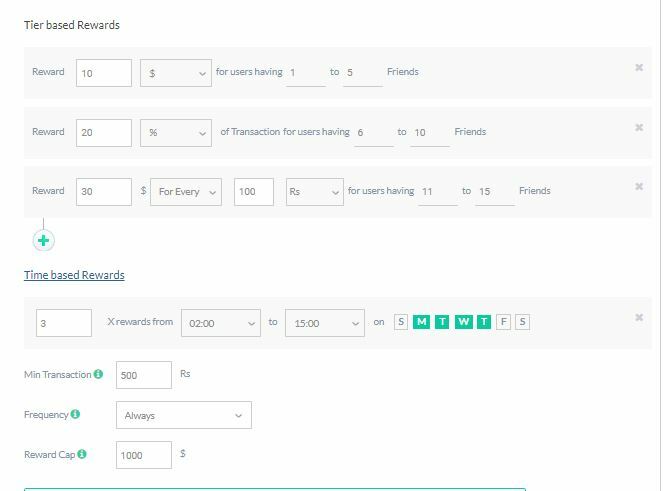 If you want to multiply the reward amount for referrers at a particular time period and specified day(s) then you can configure time-based rewards. Navigation to configure time-based rewards as follows. Note: Time-based rewards can be configured only for Referrer. Select the event type you want to schedule the reward upon Install, Sign-Up, Transaction or any custom event you may have relevance for your app. Select the event type as Transaction then you will see Basic and Advanced switch with by default Basic selected. An example is given in below screenshot, I have added the reward to multiply 3 times if the friend registers between “02:00” to “15:00” on Monday, Tuesday, Wednesday, and Thursday. I’ve also selected the minimum transaction amount as 500 and Reward cap as 1000. Click on Done and save the campaign. Now when a friend registers within the time period selected and does a minimum transaction of 500 then referrer will get a reward of 30$ ( ie, the reward of 10$ is multiplied by 3). When the friend doesn’t register within the specified time period range then referrer will get a reward of 10$ (ie, the reward will not be multiplied by 3). This reward distribution will happen for the first five friends. Note: If the friend registered within the selected time range but didn’t register on selected days in the dashboard then reward will not be multiplied by 3. The referrer will then get the reward as specified in tier based rewards. For friends from 6 to 10, when friend registers in the specified time range and does a minimum transaction of 500 then referrer will get a reward of 20% of transaction amount multiplied by 3. Similarly for friends from 11 to 15, when friend registers in the specified time range and does a minimum transaction of 500 then referrer will get the reward of 150$ multiplied by 3. If the friend doesn’t register in between the specific time period then referrer will receive a reward of 150$.